I’m guessing that this photograph was taken by some intrepid photographer climbing a tall riverside gilding such as a grain elevator as for the most part, downtown Buffalo looks quite a low lying city with few tall buildings. What strikes me about this scene is the clear summer sky, as so many of the photographs in the archive, especially of cities, are characterised by murky, overcast skies, a function I guess of the amount of atmospheric pollution endemic of the times. I also wonder what the dynamic range of the film in use was, and whether the very slow film was capable of capturing detailed skies (although to be honest, this doesn’t look like a particularly challenging exposure). The steamer is Northland, one that appears in a lot of photographs in the the Library of Congress archive. 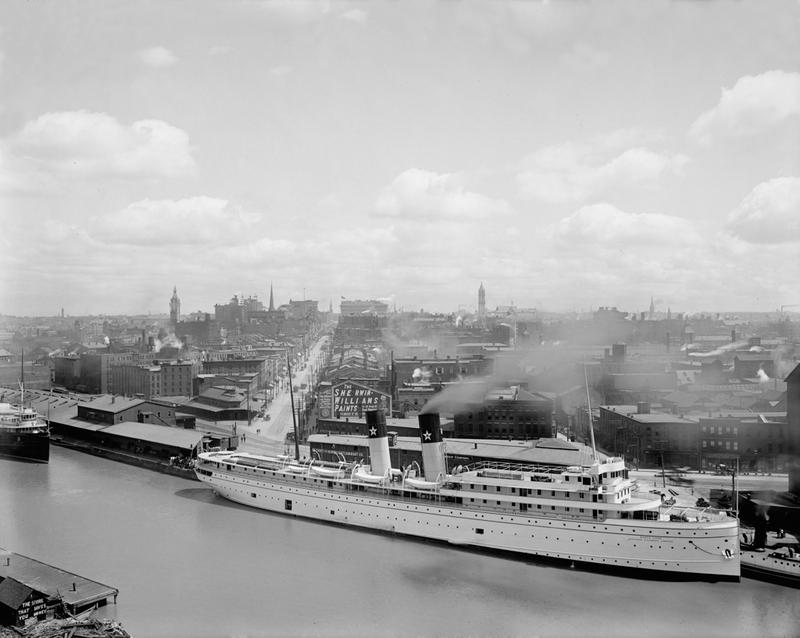 It was one of many steamers that worked on the Great Lakes. Their purpose was either to link railheads on either side of the lake or to carry tourists to the more remote areas that were all but inaccessible before cars became more available post world war 2. Northland was built in 1894 at the Globe Iron Works in Cleveland for the run between Buffalo and Duluth. This was no small pleasure steamer – it was 383 feet in length, displaced 4244 tons and carried 350 first class and 300 second class passengers. Total cost was a not insignificant $650000.